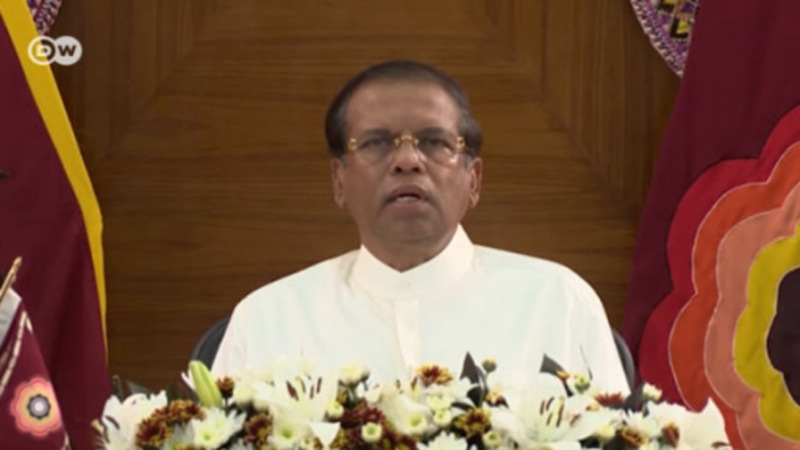 Amid an escalating political crisis in Sri Lanka, President Maithripala Sirisena dissolved the parliament on Friday. Previously, Sirisena's party admitted to not having the votes to confirm ex-strongman Mahinda Rajapaksa as the new prime minister. The crisis started two weeks ago when Sirisena sacked Prime Minister Ranil Wickramasinghe and named Rajapaksa as his successor. Wickramasinghe disputes the president's authority to fire him and has refused to leave the prime ministerial residence. New elections are likely to be held in early January, nearly two years earlier than originally planned, a government minister told the AFP news agency. Sri Lanka boasts a key strategic location in relation to global shipping lines. Its biggest city, Colombo, is set to become part of China's New Silk Road project to transport goods to the West. Former President Rajapaksa drifted close to Beijing during his 2005-2015 rule, while Wickramasinghe is considered closer to India and pro-Western. The power struggle between the factions feeds into the Asia-wide tug of war between Beijing and New Delhi. President Sirisena has failed to persuade the parliament to support his ouster of his one-time ally Wickramasinghe. Sirisena had suspended the assembly's work until mid-November when first moving against his prime minister. Later, the president said he had to fire Wickramasinghe because one of his ministers was involved in a "plot to assassinate" the head of state himself. Parliamentary speaker Karu Jayasuriya, however, slammed Sirisena's actions as a "coup, albeit without the use of tanks and guns." Jayasuriya also said that some of the lawmakers were offered bribes and ministerial posts in the new government if they supported the move. At least eight have switched sides, but at least 120 deputies in the 225-seat parliament remain loyal to Wickramasinghe. Faced with pressure from the UN, the US and the EU, Sirisena twice promised to lift the suspension of parliament, but then changed his mind. A bodyguard for a sacked minister in Sri Lanka shot at least three people as tensions escalated between Sri Lanka's top politicians. The crisis started with President Maithripala Sirisena firing PM Ranil Wickramasinghe. Sri Lankan President Sirisena has made former strongman Mahinda Rajapaksa premier after sacking Ranil Wickramasinghe. South Asia expert Siegfried O. Wolf spoke to DW about the country's resulting constitutional crisis.